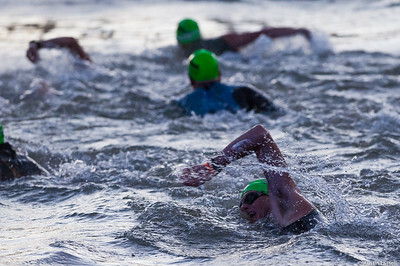 A daunting 140.6 mile triathlon, the Ironman is a grueling 2.4 mile swim, 112 miles biking and 26.2 miles running race certain to test the grit of any who choose to attempt. 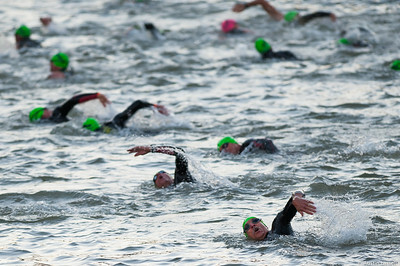 Held in numerous locations around the world, the Louisville Ironman has been hosted since 2007. 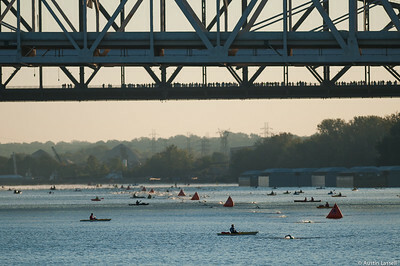 This year's race marked the tenth anniversary of the racing being hosted in Louisville. Special thanks to Jamie Rhodes. 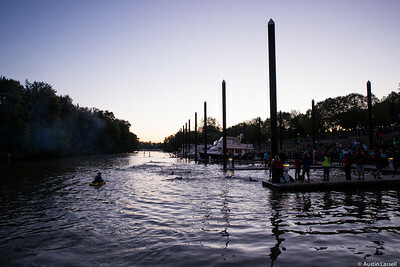 Ironman Louisville 2016 contestants headed up river at the start of the swimming portion of the race. The Ironman Louisville 2016 took place on 10-9-16 and is the 10th anniversary of the race occuring yearly in Louisville, Kentucky. 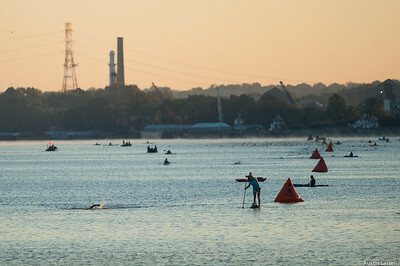 An Ironman Louisville 2016 contestant swimming near the start of the swimming portion of the race. The Ironman Louisville 2016 took place on 10-9-16 and is the 10th anniversary of the race occuring yearly in Louisville, Kentucky. 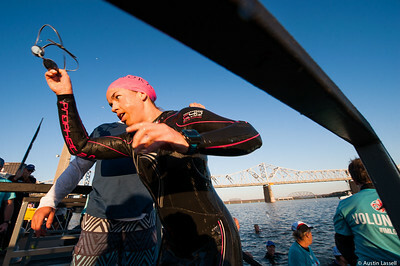 An Ironman Louisville 2016 contestant leaps into the water at start of the swimming portion of the race. The Ironman Louisville 2016 took place on 10-9-16 and is the 10th anniversary of the race occuring yearly in Louisville, Kentucky. Ironman Louisville 2016 contestant no. 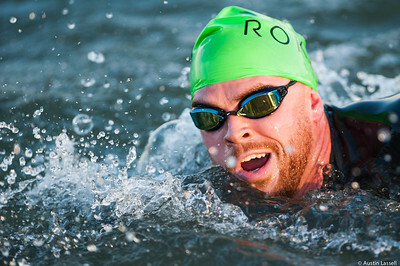 293, Alexander Mccrohan, leads well ahead of the pack as he swims down the Ohio River in the swimming portion of the race. Alexander is a 44 year old from Arizona who placed first in the 45-49 division and first overall in swimming with a time of 46:59. The Ironman Louisville 2016 took place on 10-9-16 and is the 10th anniversary of the race occuring yearly in Louisville, Kentucky. 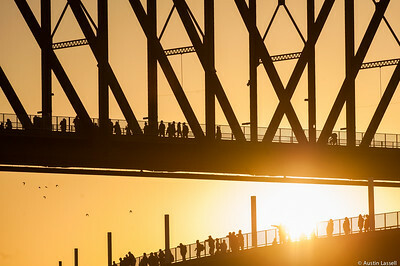 Onlookers atop the Big Four walking bridge look at swimmers competing in the Ironman Louisville 2016, swimming in the Ohio River. The Ironman Louisville 2016 took place on 10-9-16 and is the 10th anniversary of the race occuring yearly in Louisville, Kentucky. 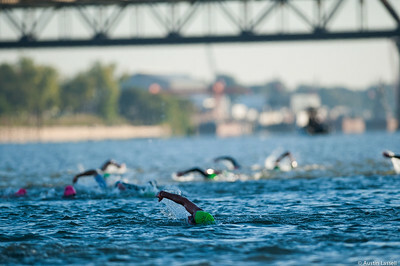 Ironman Louisville 2016 contestants swim down the Ohio River in the swimming portion of the race. The Ironman Louisville 2016 took place on 10-9-16 and is the 10th anniversary of the race occuring yearly in Louisville, Kentucky. Ironman Louisville 2016 contestant no. 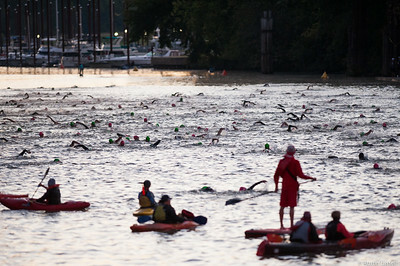 311, Jimi Young, (in front) and other contsestants swim down the Ohio River in the swimming portion of the race. Jimi is a 47 year old from Michigan who placed within the top 105 in all portions of the race within the 45-49 division and top 475 overall. He also finished top 150 overall within the cycling portion of the race. The Ironman Louisville 2016 took place on 10-9-16 and is the 10th anniversary of the race occuring yearly in Louisville, Kentucky. Ironman Louisville 2016 contestant no. 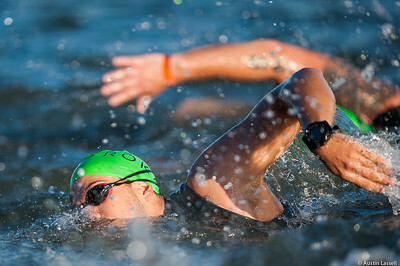 293, Alexander Mccrohan, swims past spectators along the Ohio River in the swimming portion of the race. Alexander is a 44 year old from Arizona who placed first in the 45-49 division and first overall in swimming with a time of 46:59.. The Ironman Louisville 2016 took place on 10-9-16 and is the 10th anniversary of the race occuring yearly in Louisville, Kentucky. Ironman Louisville 2016 contestant no. 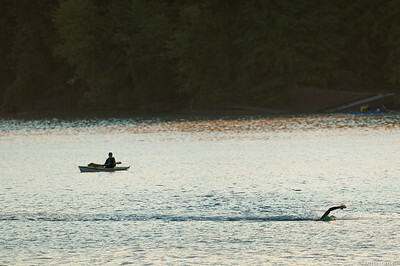 1411, Andrew Magazine, competing in the swimming portion of the race. 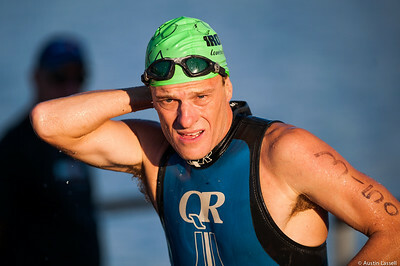 Andrew, a 26 year old from Kentucky, placed seventh in the 25-29 division and 32nd overall in swimming. Within his division he finished in the top 125 in the other two portions of the race. The Ironman Louisville 2016 took place on 10-9-16 and is the 10th anniversary of the race occuring yearly in Louisville, Kentucky. 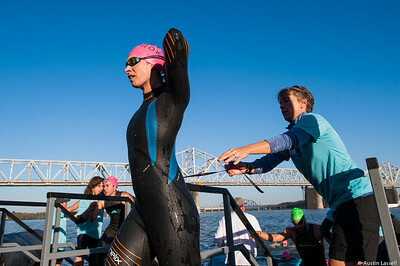 An Ironman Louisville 2016 contestant competing in the swimming portion of the race. The Ironman Louisville 2016 took place on 10-9-16 and is the 10th anniversary of the race occuring yearly in Louisville, Kentucky. Ironman Louisville 2016 contestant no. 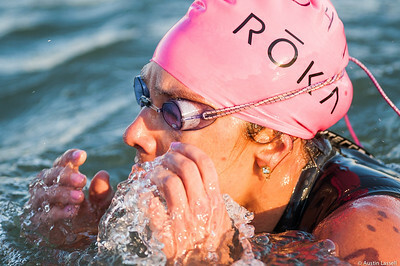 347, Jenn Kunklinski, reaches for her fogged goggles as she nears the competion of the swimming portion of the race. 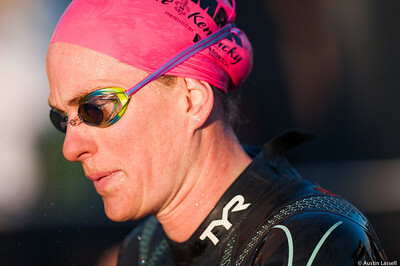 Jenn is a 34 year old from Alabama who placed second in the 30-34 division and 27th overall in swimming. She finished top ten in her division in the other two portions of the race and top 325 overall. The Ironman Louisville 2016 took place on 10-9-16 and is the 10th anniversary of the race occuring yearly in Louisville, Kentucky. 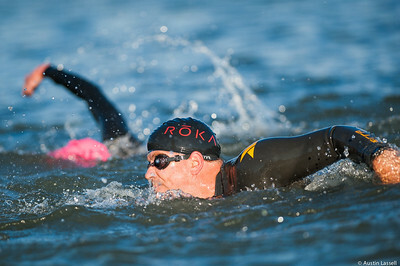 An Ironman Louisville 2016 contestant competes near the finish of the swimming portion of the race. The Ironman Louisville 2016 took place on 10-9-16 and is the 10th anniversary of the race occuring yearly in Louisville, Kentucky. Ironman Louisville 2016 contestant no. 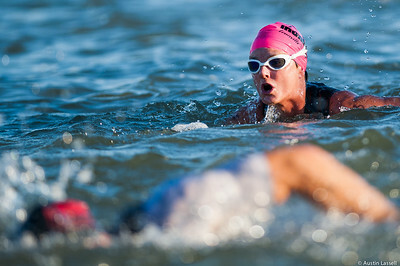 3099, Christina Norris, competing in the swimming portion of the race. Christina is a 61 year old from Kentucky who placed third in both swimming and running and second in cycling within the 60-64 division. The Ironman Louisville 2016 took place on 10-9-16 and is the 10th anniversary of the race occuring yearly in Louisville, Kentucky. 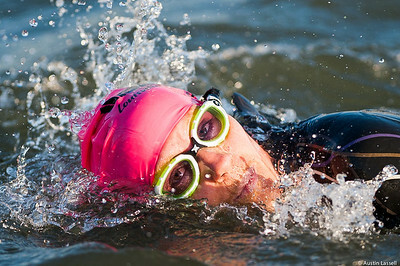 An Ironman Louisville 2016 contestant exits the Ohio River and removes her goggles at the completion of the swimming portion of the race. The Ironman Louisville 2016 took place on 10-9-16 and is the 10th anniversary of the race occuring yearly in Louisville, Kentucky. 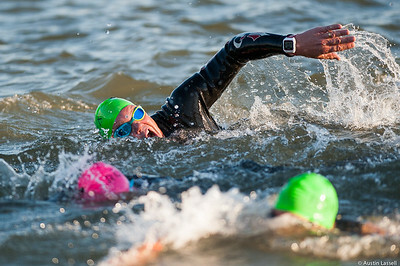 An Ironman Louisville 2016 contestant moments after exiting the water at the completion of the swimming portion of the race, heads towards the next phase of the triathalon, cyclying. The Ironman Louisville 2016 took place on 10-9-16 and is the 10th anniversary of the race occuring yearly in Louisville, Kentucky. Ironman Louisville 2016 contestant no. 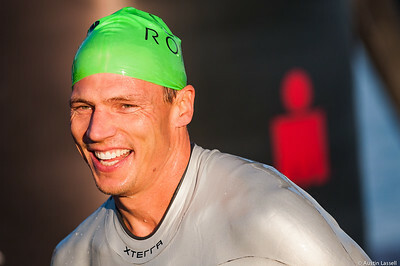 139, Joe Langel, smiles moments after exiting the water at the completion of the swimming portion of the race while heading to the next phase of the triathalon, cyclying. 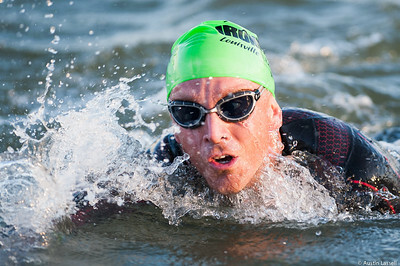 Joe is a 43 year old from Minnesota who placed in 20th in the 40-44 division and top 100 overall in swimming. He finished top 100th in all portions of the race within his division and top 600 overall. The Ironman Louisville 2016 took place on 10-9-16 and is the 10th anniversary of the race occuring yearly in Louisville, Kentucky. Ironman Louisville 2016 contestant no. 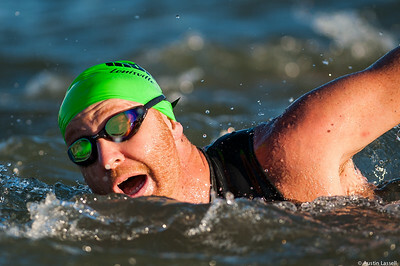 2755, Phil Kaiser, competing in the swimming portion of the race. Phil is a 54 year old from Kentucky who placed in the top 200 in all portions of the race within the 50-54 division. The Ironman Louisville 2016 took place on 10-9-16 and is the 10th anniversary of the race occuring yearly in Louisville, Kentucky. Ironman Louisville 2016 contestant no. 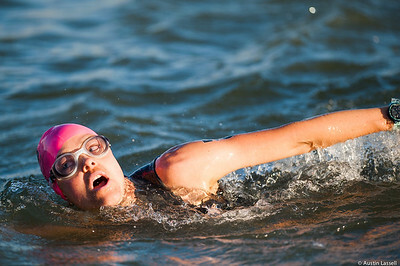 596, Gabi Connor, competing in the swimming portion of the race. Gabi is a 24 year old from Pennsylvania who placed 5th in swimming, and first in both cycling and running in the 18-24 division. She finished top 300 overall. The Ironman Louisville 2016 took place on 10-9-16 and is the 10th anniversary of the race occuring yearly in Louisville, Kentucky. 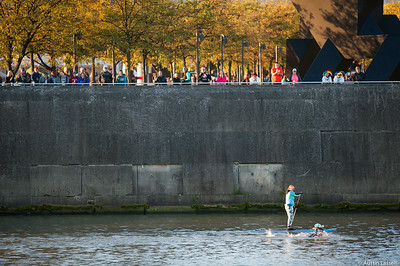 An Ironman Louisville 2016 contestant exit the Ohio River at the completion of the swimming portion of the race. The Ironman Louisville 2016 took place on 10-9-16 and is the 10th anniversary of the race occuring yearly in Louisville, Kentucky. Ironman Louisville 2016 contestant no. 3150, Mike Campell, begins removing his wetsuit moments after exiting the water at the completion of the swimming portion of the race in preparation for the next phase of the triathalon, cyclying. Mike is a 43 year old from Canada who placed in the top 100 in all portions of the race for the 40-44 division. He finished in the top 200 in swimming and top 275 overall. The Ironman Louisville 2016 took place on 10-9-16 and is the 10th anniversary of the race occuring yearly in Louisville, Kentucky. Ironman Louisville 2016 contestant no. 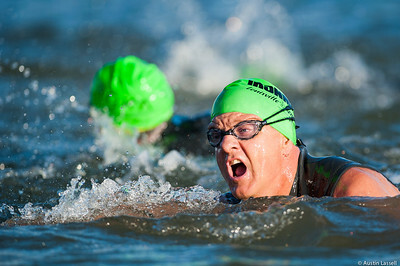 2013, Jeff Black, competing in the swimming portion of the race. Jeff is a 41 year old from Missouri who placed top 75 in all portions of the race within the 40-44 division and finished top 500 overall. The Ironman Louisville 2016 took place on 10-9-16 and is the 10th anniversary of the race occuring yearly in Louisville, Kentucky. Ironman Louisville 2016 contestant no. 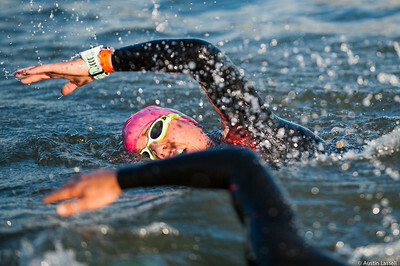 1301, Fernando Gomez, competing in the swimming portion of the race. Fernando is a 24 year old from Florida who placed in the top 40 for all portions of the race within the 18-24 division. The Ironman Louisville 2016 took place on 10-9-16 and is the 10th anniversary of the race occuring yearly in Louisville, Kentucky.